Attend an interview and Q & A with Emmy, Golden Globe, Academy, SAG Award-nominated actor and TV/Film director, Bob Balaban. Q&A begins at 1:30 PM, Cleo performance begins at 2:30 PM. 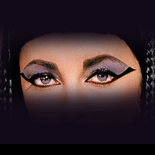 To attend the Q & A, tickets must be purchased for the matinee performance of Cleo. A comedy about the titanic love affair between Elizabeth Taylor and Richard Burton during the filming of 1963’s Cleopatra that created a worldwide scandal.